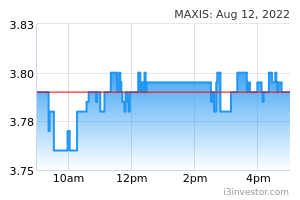 Maxis Bhd is a telecommunications provider. Its primary services include mobile, wireless, fixed, and enterprise services, with the majority of revenue generated from mobile and wireless. The company generates mobile revenue from prepaid and postpaid subscribers, with roughly an even split between both. Within enterprise services, Maxis provides traditional managed services in addition to mobile and fixed services. Additionally, the company owns fiber backhaul infrastructure. The company generates the vast majority of its revenue in Malaysia. Junichiro "with the old fella is back.."
We need this old man. It is jibby who raise spectrum fees and put telcos on slippery slope. Why is BN gomen so hard up for $$$. Now it is clear that 1MDB have put M'sia in financial strain. Jibby is living on borrowed time. Even if BN is in power, crash will come. All the wasteful gomen spending by Jibby such as TRX is just to put M'sian temporarily on cloud 9. Now there is oversupply of office space. By the time TRX is completed, we are likely to see a recession. Google to see the correlation between recession n skyscrapers. kiasoocheena not interested in the previous fella as well. apolloang apa ini? profit down still can up 6cts? 86chong what is the good price to in? curious2 RM 89 30Mbps broadband any1 here using? Any complain abt their service? TM very slow yet expensive. wisdomtot TM thought they were smart to restrict their 30Mbps plan for B40...alienating the M40 and T20...which have now been the customer segments targeted by Maxis... well done Maxis..after this Maxis can cross sell, up sell to these 2 big spending groups... the marketing strategy brains are definitely in Maxis. Quick to pounce on opportunities..
Junichiro In the short term, its EPS would be reduced due to cut in prices. In the long term, it has now another source of growth since there are so many unserved or under-served areas which TM would not venture. JinAurora Maxis is the large client of binacom, recently maxis launched new plan and expand the business into fiber optic sector, binacom definitely will have advantage on this expansion. Lim Tek Wai Well done, the profit can let me to buy more food. BN_better RM 89 30 Mbps no 1 use in i3 true? Any complain bec TM unlimited plan min is RM 129.
msnX13 Maxis got staff attitude problem since its binariang early launched in 1990s until today. relaks Takutnya! Aku nyaris kencing! Reminded of my COO masa aku freshie dulu. Dia ni, bila marah ( selalu, very hot tempered punya org) sweep everything off his desk! Klau ada pen, buku atau file, dia langsung throw at the staff! Macam tu! Tiap2 Isnin meeting, aku duduk hujung hujung bilik, near the door. Bila dia hantam meja, baling file, I cepat2 cabot pigi tandas! Hahaha! Dunno how my manager bole tahan. Lucky, aku tak report sama dia. Bila dia quarrel with his wife, come to office pick on semua org! Org macam tu really not fit to be in management. Need counselling! That lady too! stuffx The issue with maxis staff attitude is not a new thing. I have been scolded once by a Maxis staff because I canceled my iphone pre-order due to their late delivery. matkaya yeah keep on listening to all those articles and IB advice...you'll be a very good investor. commonsense In terms of financials, the company actually did not do that bad. 9m18 revenue was actually flat vs 9m17 (fell by 2.5%). However the 9 months profit ,PBT and PAT fell by 8% and 7% respectively which signals margins compression which is likely to continue going forward. Given the high valuation of 20x PE, investors would have expect the company to provide them with some profit growth to compensate the high price paid. 2) Malaysia is already a saturated market. On average Malaysian owns more than 1 phone per person. 3) Government pressure for telco companies to reduce their price but at the same time provide better services to the public which would only mean lesser revenue but higher capex and opex cost. All these will only expect to lower the company's margin even further. Based on the average forecast of 7 analysts, the target PAT for FY19 is RM1.87bil. At the current price, the company is valued at 22.7x PE which is high for a company that will actually provide limited profit growth to its investors (if any). Another pressure to the share price would be the continuous selling by EPF. As of 3rd December, they still have 898mil shares of the company. Those that are interested in the telco industry are advice to look at other companies that might be able to provide some growth but at a cheaper valuation. Maybe try looking at companies that are not directly involve in the telco industry but is a proxy/ service provider to it. Like cable supplier/ provider or telco tower owners etc. If you are still interested in Maxis, maybe just wait till EPF stops selling. Those that are already invested are advice to diversify their portfolio to companies that would be able to provide some profit growth in the near to mid term (to compensate Maxis negative profit growth for the same period). For those looking to diversify their portfolio outside of the Telco industry, i would recommend them to look at MBMR. The company is a direct proxy to Perodua via its 22.6% interest in the company. Valuation is cheap at only 5.9x PE (based on target FY18 PATAMI of RM145mil. 9m PATAMI is already RM106mil). PB is low at only 0.6x BV. 4Q18 results is expected to be higher than 3Q18 and last year's 4Q17. And FY19 growth will be driven by the still high demand of new Myvi and the launch of the new SUV in 1Q19. Please go through the analyst reports (https://klse.i3investor.com/servlets/stk/pt/5983.jsp) and do your own analysis before making any decisions. Hope Maxis can proof me wrong and deliver the growth that are expected of them from their existing shareholders. LouiseS Last 5 years EPS on increasing trend, increased by 16.5% over last 5 years, PE ratio is high at 21.83, ROE 28.52%, and dividend yield 3.45%. DickyMe The demise of Maxis is forthcoming. 50% maybe wiped out. Same stale business, arrogant customer service, uncreative products, lousy connection and exorbitant price. shpg22 Telco are being piggybacked by those internet giant that parasites on their network. Last time they used to make tons of money from IDD and local call. Now no more. But CAPEX spending is rising with new tech like 5G, later 6G, 7G. Slowly and surely they will be sucked dry. Dickyyou EPF keep disposed. Will drop below RM 5? DickyMe 15 sen down..hem..more should drop. lailaiaa Maxis team up with huawei for 5G, a global scandal-plaqued company operating as an espionage company for commie china. Expect maxis go to holan today. WINNING maxis start to moving up. mawiLegend lets move to INARI they started installing 5G,,obviously confirmation i-phone is the 1st phone will use 5G!!! just c the shark buy milions cap INARI guys!!! come on open ur eyes n brain! !